Although we write a lot about septic tanks, the most important part of a septic system is actually the drainfield, where water leaving the tank is held until it percolates into the soil (where most treatment happens). When a septic system’s drainfield fails, it’s generally for one or more of the following four reasons. The average life of a drainfield is approximately 25 years, depending on its usage and maintenance. Dripping faucets, running commodes, and malfunctioning water softeners put extra water into the septic system, which can flood out your drainfield. Higher-than-normal usage on the system from occupants or visitors can overload the system as well. Tree roots can infiltrate a septic system drainfield, preventing the effluent from percolating into the soil. Also, sludge buildup from not routinely pumping the septic tank can clog the drainfield pipes. Heavy items such as vehicles, horses, and permanent structures can crush pipes and compact the soil, causing damage to the drainfield. Do not build structures over a septic system. Can a drainfield be repaired? In some cases, yes. But if your system has reached its life expectancy, investigating a cause could be throwing good money after bad. In some situations septic system repairs may mean installing a totally new system. 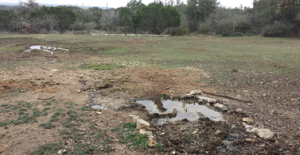 No septic system drainfield will last forever, but there are many things you can do to keep your drainfield working well. Preventive care is best, but don’t wait to call a septic maintenance provider if you are having trouble with your drainfield. Need drainfield help today? Please call us at 210.698.2000 (San Antonio) or 830.249.4000 (Boerne) or contact us online to schedule an appointment. ← Septic Tank Pumping vs. Cleaning: What’s the Difference?